Partner with us to create better opportunities for everyone. The world’s poor come into contact with markets and companies as producers, workers, entrepreneurs, neighbours or consumers on a daily basis. That’s why we partner with private sector companies to co-create opportunities for poor and marginalised people to have better access to goods, services and livelihoods – and on fair terms. We recognise that building such models is not easy. Inclusive business models which deliver economic growth and positive results for poor people require the trust of local communities and deep knowledge of development issues. Our extensive experience creating innovative and strategic partnerships with private sector companies uses combined expertise and resources to create large-scale sustainable poverty-fighting projects, benefiting both companies and the lives of millions of people across the world. As women are more likely to be poor and marginalised, we focus on them as it leads to better business and development returns. We are looking for sponsors to help make #March4Women 2019 – our flagship International Women’s Day event in London – bigger, better and more impactful than ever before. By joining us as a sponsoring partner of #March4Women 2019, you will get wide-ranging brand exposure and publicity through a public showcasing of your commitment to gender equality and women’s rights. To find out more about our plans for #March4Women 2019, how you can get involved, and the wide range of sponsor benefits we can offer, please contact Jo Broughton in our #March4Women team. For other enquiries about partnering with us on poverty-fighting initiatives around the world, please use the 'Contact Us' button above. 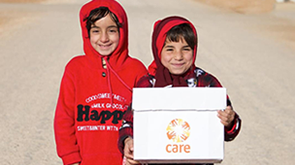 CARE has on-the-ground presence and experience in over 90 countries across the world with a range of technical expertise. CARE’s private sector work spans all the Sustainable Development Goals but at the core of what we do is: SDG 1 – no poverty, SDG 5 – reduce gender inequalities, SDG 10 – reduce inequalities and SDG 17 – partnerships for the goals. We work with companies to develop inclusive value chains that deliver commercial and social returns by empowering producers, workers, entrepreneurs, organisations and communities. We work with companies, particularly the financial sector, to enable communities to save, invest and plan for the future. Poor access to health and poverty go hand-in-hand. We partner with companies to fight poverty by improving the health of millions of the world’s poorest people. We work with employers to improve their workplace systems and empower workers to achieve dignified work. We partner with the private sector to rapidly respond to emergencies, create long-term sustainable recovery and enable communities to develop their disaster preparedness.